Horses have fallen ill with a strain of equine herpes virus, or EHV-1, that can cause respiratory and neurological damage. EHV-1 can sometimes become a neurological infection, called equine herpes myeloencephalopathy, which destroys blood vessels and leads to damage of the brain and spinal cord. 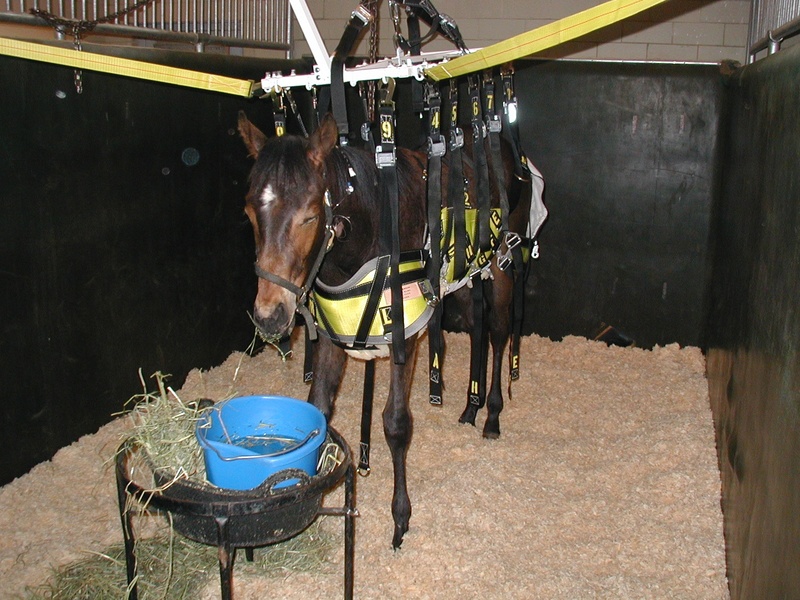 Horses with the neurological form may have to lean against a wall for balance or be unable to stand up. DENVER—Veterinarians and horse owners across the West are struggling to contain a highly contagious and potentially deadly equine virus that has so far infected at least 34 horses in nine states, from Texas to Washington. The outbreak of Equine Herpes Virus-1 has forced authorities to cancel or postpone many riding competitions, rodeos, fairground exhibitions and horse auctions in several Western states and Canada. “This outbreak is much more widespread than most, or perhaps any, previous outbreak,” said Keith Roehr, the Colorado state veterinarian. At least seven horses infected with the disease have been euthanized. Equine Herpes Virus-1 has been around for decades and is quite common; a number of vaccines effectively control symptoms. But in the past several years, veterinarians in many states have reported outbreaks of a mutant form of the virus. The vaccine does not protect against this form of the virus. It’s this mutant form that appears to be afflicting horses who attended the cutting-horse competition in Ogden, said Dr. Bruce King, Utah’s state veterinarian. The Canadian Horse Defence Coalition (CHDC) has learned that Bouvry Exports horse slaughter plant in Fort MacLeod, Alberta closed operations on December 3rd to complete renovations related to sanitation. This news is not surpising. It is well documented that horse slaughter operations in Canada and the U.S. have a long history of pollution troubles and violations. Interestingly, it was due to sanitation and food safety concerns that Natural Valley Farms (NVF) in Saskatchewan was closed by the CFIA in December 2008. The now defunct Saskatchewan horse slaughter plant closed its business shortly thereafter. In Texas, the Dallas Crown plant was ordered closed for pollution and sewer violations. The Cavel plant in Illinois had similarly been in violation of its sewer discharge limits before its closure. The CHDC was also advised that a European Union audit was carried out at Bouvry Exports at the end of November, however this information has not been verified. The CHDC again calls on the CFIA and the Minister of Agriculture to put an end to the suffering of horses and close this cruelty-driven and environmentally detrimental industry, and calls on all Member of Parliament to bring Bill C-544 forward in Parliament, to shut down horse slaughter in Canada, once and for all. Police say no criminal charges will be laid after allegations of animal cruelty were made against a Fort MacLeod horse slaughterhouse. The investigation was launched after RCMP were given video from the Canadian Horse Defence Coalition depicting what they believe to be footage taken at Bouvry Exports Calgary Ltd. In the video, said to document 10 hours at Bouvry and a Quebec horse processing plant, the group said there was unacceptable treatment of 13 horses killed at the facility in this province. RCMP Sgt. Patrick Webb said the investigation is now concluded and there was nothing criminal found. “We have decided there will be no charges from RCMP,” he said Tuesday. In a conversation between Int’l Fund for Horses and a former officer, he predicted an outcome like this because of the way the evidence was gathered, not the nature of the events captured, which are clear violations. Then there is the matter of “intent,” which always makes it difficult to convict in slaughter cruelty cases. RCMP officials say they found no evidence of intent to cause cruelty to any of the horses at the slaughterhouse so no charges will be laid. This means chances are extremely high the slaughter of horses is going on right now at Bouvry’s and Richlieu in the manner show in the CHDC videos. This clearly demonstrates that no amount of regulation can make these “chambers of carnage” anything but brutal, terrifying and inhumane. Horse slaughter for human consumption must stop in Canada, Mexico and any other place in the world where it occurs. Horses are not for eating. 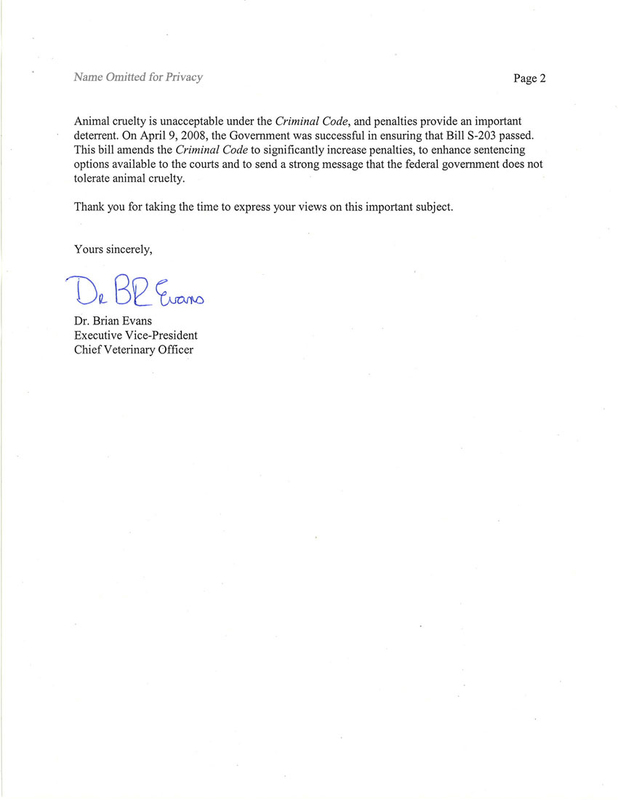 The following is the full text of a letter written by DR. BRIAN EVANS, Executive Vice President and Chief Veterinary Officer of the Canadian Food Inspection Agency. 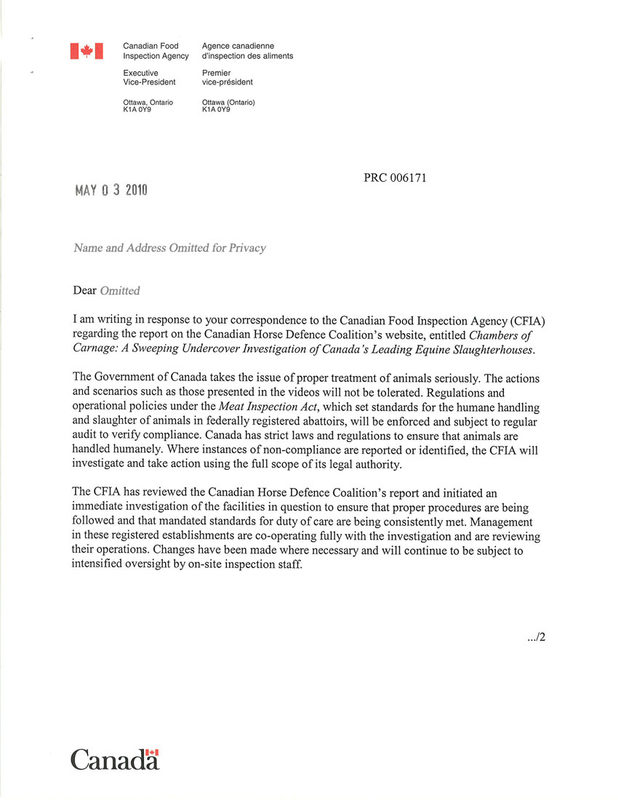 I am writing in response to your correspondence to the Canadian Food Inspection Agency (CFIA) regarding the report on the Canadian Horse Defence Coalition’s website, entitled Chambers of Carnage: A Sweeping Undercover Investigation of Canada’s Leading Equine Slaughterhouses. The government of Canada takes the issue of proper treatment of animals seriously. The actions and scenarios such as those presented in the videos will not be tolerated. Regulations and operational policies under the Meat Inspection Act, which set standards for humane handling and slaughter of animals in federal registered abattoirs, will be enforced and subject to regular audit to verify compliance. Canada has strict laws and regulations to ensure that animals are handled humanely. Where instances of non-compliance are reported or identified, the CFIA will investigate and take action using the full scope of its legal authority. 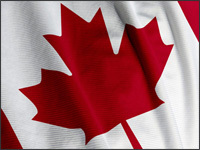 The CFIA has reviewed the Canada Horse Defence Coalition’s report and initiated an immediate investigation of the facilities in question to ensure that proper procedures are being followed and that mandated standards for duty of care are consistently met. Management in these registered establishments are co-operating fully with the investigation and are reviewing their operations. Changes have been made where necessary and will continue to be subject to intensified oversight by on-site inspection staff. Animal cruelty is unacceptable under the Criminal Code, and penalties provide an important deterrent. On April 9, 2008, the Government was successful in ensuring that Bill S-203 passed. This bill amends the Criminal Code to significantly increase penalties, to enhance sentencing options available to the courts and to send a strong message that the federal government does not tolerate animal cruelty. Thank you for taking the time to express your views on this important subject. See original letter. Click image to enlarge.